Somerset as you know is popular for cheddar cheese and ciders as well as for its coastal towns, beaches and beautiful natural surroundings. Somerset balloon rides will provide you the opportunity to have a live experience of the beautiful scenery at heights of up to 6, 000 ft! If you want to explore southern regions of Somerset then you can start from Taunton. It is called this because it was established on the river ‘tone’. This town is between Black Down Hills and Taunton Deane Vale. Several impressive churches are such as St. James. It is also possible to have view of the Taunton Annual shower and Taunton Castle. The Bridgewater and Taunton canal also offers a great sight from the air. Another area which is a good launch site is Ilminster which lies in the south of Somerset. It lays half way between Taunton and Yeovil. The church of Ilminster known for its architecture provides one of the most noticeable features. 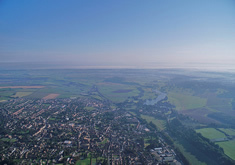 Somerset officially has 400 villages which offer a serene sight from a hot air balloon. As a County it is the 7th largest within England and by population it stands at 22nd largest. There is a population of half a million residing in total within the Somerset borders. With such large and beautiful areas to be seen, a hot air balloon ride over Somerset is the perfect fun experience or gift to give to a loved one or relation. All in all Somerset balloon rides will provide a refreshing experience.